"Project/Object has a repertoire of over 100 Zappa songs, with several arrangements of each tune. (Ike) Willis likens their task to a symphony playing Bach or Beethoven." For more info about the artist, please visit Artist Official Website. PROJECT/OBJECT formed in the early '90s as an offshoot from an annual Frank Zappa birthday celebration that took place in guitarist Andre Cholmondeley's basement in New Jersey. As the event grew in size and popularity, PROJECT/OBJECT decided to take their show on the road, performing Zappa's music in more cities and larger venues, with a growing set list from every era of Zappa's 30-year recording career. The band strives to stay true to Frank's vision of constantly challenging the musicians and the audiences. During Zappa's 1984 and 1988 tours, members of PROJECT/OBJECT became friendly with Ike Willis, the legendary 10-plus year Zappa vocalist and guitarist whose career with Frank began in the role of "Joe" on the quintessential Zappa album, Joe's Garage. In 1995, the members of PROJECT/OBJECT sent a tape of a live show to Ike and he was impressed enough that he agreed to come out to the East Coast to join the band onstage for a few gigs in the New York area. After that tremendous first outing, Ike agreed to repeat this experience in the future. Ike felt the members of PROJECT/OBJECT were able to recreate the fun and excitement that he felt with Frank Zappa on stage. Many other Zappa alumni feel the same way, which has also inspired them to perform with the band, some for entire tours. Since 1998, when the band first took their act on the road, the following alumni have performed with the band: Willis, Napoleon Murphy Brock, Jimmy Carl Black, Ray White, Don Preston, Bunk Gardner, Denny Walley, Mike Keneally, Arthur Barrow, Ed Mann, Roy Estrada, Billy Mundi and even Al Malkin. Other notable artists they've collaborated with include Phish's Jon Fishman, Capt. Beefheart/Jeff Buckley guitarist Gary Lucas, Chuck Garvey, Al Schnier and Jim Loughlin of moe., New York City big band leader and "Zappologist" Ed Palermo, and Dweezil Zappa drummer Jerry Cucurullo. Frank Zappa was extremely influential to many musicians and bands, especially many jambands, including Phish, moe. and Umphrey's McGee. While many jamband fans are aware that Frank Zappa was influential, they are largely unfamiliar with his music. Of those who are familiar, many were too young to have seen him in concert. 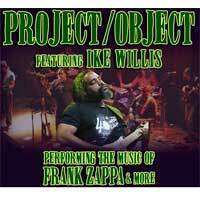 PROJECT/OBJECT is the closest they will get to the live Zappa experience, and the band has been enjoying increasing support from this growing scene. In every new market they visit, PROJECT/OBJECT converts the curious into dedicated fans. They want to remind old Zappa fans of the way it used to be and let younger fans, that never experienced a Zappa show, see and hear the way it was.